Mechanical claws of excavators have been tearing into buildings in an upmarket area of Kenya’s capital, Nairobi, at the government’s request. Plush homes and shopping malls are among the 4,000 or so buildings targeted for demolition. Among them, the Ukay Centre, housing a large supermarket and other small shops, has been reduced to rubble. Kenya’s environmental agency (Nema) says the structures are illegal, some of which have been built on wetlands. News of the destruction of less permanent structures is more common. Last month, the homes of about 30,000 people were demolished in a Nairobi slum to make way for a new dual carriage way. The Ukay Centre’s owners had failed to get a court injunction to save the $9m (£7m) property. Owner Bimal Shah told the hearing he had brought his wife along “so that if I collapse, she can take me home,” the Star news site reports. Dramatic footage shows the building being knocked down. Local media say rubble fell on one of the workmen who emerged dusty but unharmed. 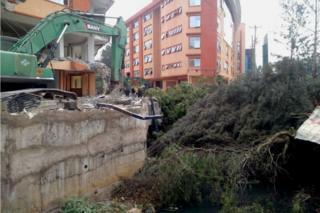 Government agency Nema says that it had issued a three-month notice of the demolition that expired last Sunday. A tenant told the Nation newspaper that he thought they had until next week Tuesday to move out. “We were notified that we had until Tuesday to move out but that changed this morning when excavators arrived here. We are waiting for them to demolish then see what we can salvage,” Kavit Shah said. Other tenants said they had been caught off guard and that most of their stock was still inside the mall. Petrol stations, car parks, commercial buildings, apartment block [and larger homes] are among the 4,000 properties listed for demolition. Some desperate property owners have tried to bribe their way out of being bulldozed, according to Nairobi Central Business District Chief Julius Wanjau. “I am being called by strange numbers telling me to stop this exercise so that we can talk. I am receiving money on [mobile money transfer service] Mpesa from new numbers and I’m forced to send back,” he told the Star. Nema says structures close to the Nairobi River are to be cleared for environmental reasons, other areas to be cleared are earmarked for public utilities and roads. The operations are reportedly part of a wider regeneration plan for Nairobi. President Uhuru Kenyatta says the demolition will press ahead and the officials who gave the go-ahead for the land to be built on in the first place will be punished. Nairobi Governor Mike Sonko, meanwhile, says he will lead by example with his own property. “It does not matter how well connected you are, if you have built on a road reserve or water ways, that structure has to go down.